From the fertile fields along the lush River Deltas of Northern California, comes what is very possibly the most succulent, orchard-fresh fruit available anywhere. A healthy, refined gift that’s a statement of style and truly good taste, this real willow and rustic hand-woven grass gift basket is filled with the orchard’s best including ripe Beurre Bosc, Red Sensation and Imperial Comice Pears, plus Fuji Apples, Navel Oranges, Pistachios, Cheese Crisps and more. It’s the perfect gift for health fans, friends and family everywhere! Arrives orchard-fresh, ripe and ready to eat! Dark Chocolate-Covered Almonds and more! From the fertile fields along the lush River Deltas of Northern California, comes what is very possibly the most succulent, orchard-fresh fruit available anywhere. 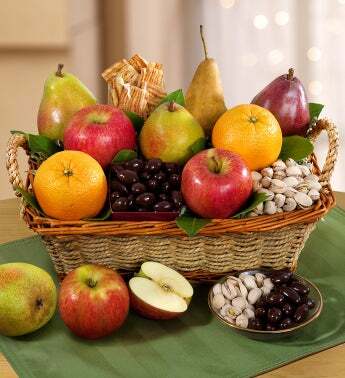 Send this fruit gift basket today!